Read an article from Business Times yesterday on Fresh Graduate Pay Survey 2014. The investigation is conducted by Hay Group, a recruitment company who had been tracking the figures annually since 2009. Meanwhile, diploma holders can look forward to an average starting salary of S$1,878 per month. The Fresh Graduate Pay Survey 2014 revealed that for Bachelor Degree (without honours), jobs in Engineering were at the top, commanding the highest average starting salary of S$2,888 per month, followed by jobs in Legal (S$2,856 per month) and Information Technology (S$2,816 per month). For diploma holders, Engineering graduates command the highest average starting salary of S$1,976 per month, with Marketing graduates coming in second at S$1,938 per month and Administration/ Support/Service graduates taking third place at S$1,925 per month. I worked in the offshore and marine industry. Taking 2011 to 2013 as a gauge, I had experiences hiring fresh graduates with NTU or NUS Mechanical Engineering Honors degree (non-1st class). The confirmation monthly salary is averaged S$3,100 for engineering positions be it design, project or sales technical support role. I also hear from the market that Keppel or Sembawang are offering around S$2,800 to 3,300 per month for average fresh graduates pursuing engineering roles. In some cases, fresh jobseekers are required to sign a two-year bond. Rewind eleven years, it was me and friends throwing my graduation mortarboard. I was from Mechanical Engineering faculty receiving my 2nd Lower honours degree, filled with hopes and aspirations so eager to join the workforce. Unfortunately, it was also the time when Singapore economic outlook was dark clouded by the impact of Iraqi war and fallen oil prices having weathered the 911 terrorist act only less than two years ago. If you think that it is a very bad timing to graduate, the worst has yet to come! Singapore was plagued by one the worst epidemic crisis when the first case of severe acute respiratory syndrome (SARS) was announced in the beginning of 2003. The SARS outbreak caused fear and anxiety among Singaporeans and tourists with all businesses badly affected. Singapore economy contracted and unemployment is at all-time high of 5.5 percent. My hopes of landing my first graduation job were shattered when my many applications sent were without even a single reply for interview. Not to be deterred, I disciplined myself to send more customised resumes each day and finally I was summoned for my first interview. The first experience was me braving through rainy day interviewing to become a procurement engineer buying electronic components. During the interview, I failed to identify the function of a particular prototype. The second interview was a design engineer position focusing on software design and modelling. This time I was hammered with design questions I could not answer. The outcome was pretty obvious. On both occasions, I was not selected. My third interview was for a mechanical engineer project role. It is a SGX listed firm in the oil and gas sector doing really well then (I was told by the recruitment agent). It did not go easy again, but I was better prepared this time. My interviewer was very stern sending fear down my spine as he questioned. I went through a two-hour long interview including 45 minutes of impromptu writing test in a room alone. Thankfully for me, I beat a very thick stack of application letters/resume, my future boss showed me. On the same day of interview, I was told that my gross salary will be S$1,800 per month. However in view that I have a degree with honours, my future-boss make clear that he was willing to pressure the HR to offer me S$2,000 per month. 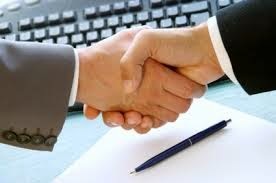 In return, I must promise not to negotiate the salary or any other terms later when contacted by the HR. I agree without hesitation. “Anything as long as you hire me”, I thought to myself then. A week later, I signed the employment contract without any negotiations as promised. 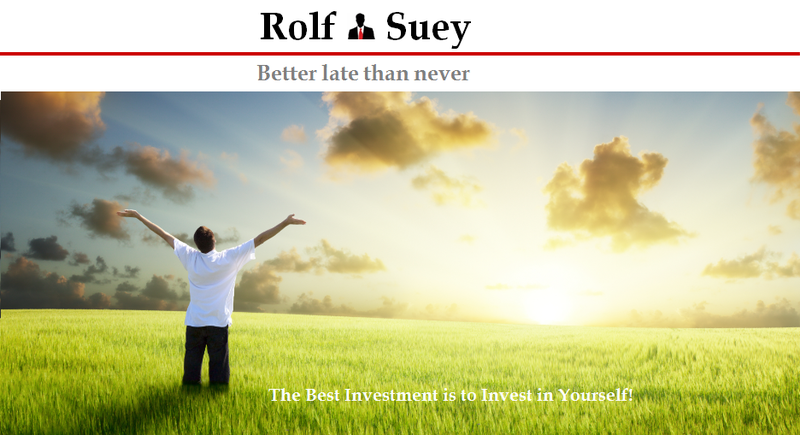 The letter of offer includes a 4-month bond and penalty of S$6,000 if I breach it. The company of course can terminate me anytime as and when they deem fit. Probation is 6 months with no annual and sick leave for the first year of employment. Am I Happy? Yes of course! I was 25 years of age then desperate to earn my first pay check. Coming from a humble family, I was already carrying a debt of S$35,000 as a result of my tuition fees, study and computer loans. Moreover it does not help that my loan repayments and interest rates for the debts already started on the day I graduated. In that year, let alone fresh graduates, even jobseekers with work experiences had uphill trask finding a job. Companies are busy cutting costs and reducing headcounts. Many of my friends took more than six months looking for jobs, and still nowhere close to being hired, with many ended in temporary contract jobs. Therefore penning my maiden employment contract considering the circumstances, is sufficient to make me very happy. Those one-sided employment terms did not bother me at all. While I am happy with my S$2,000 a month salary, a friend graduated with 1st class Honours Mech Engineering degree got a job at Hewlett Packard starting at S$2,700. Another friend in the same Engineering cohort but specialized in Electrical and Electronics with 3rd Class Honours ended up with Philip Electronics at S$2,500. The banking sector like DBS is offering management trainee positions for Engineering graduate with minimum 2nd Lower Honours at S$2,500 too. There are also friends in the same course and holding the same certificate as me, starting at S$2,100 or S$2,200 in a smaller local firm. Others with engineering degrees, who are not so lucky to find an ideal job, are willing to start with S$1,800 per month. To summarize, S$2,250 should be a reasonable estimation for Fresh Engineering Graduates from NTU holding at least 2nd Lower Honours in year 2003. Comparing similar certificate at S$2,853 today, it is approximately 27% higher than what fresh graduates received more than 10 years ago. For diploma holders, the average starting pay should be about S$1,500 for Engineering graduate in 2003 – my own estimate!. 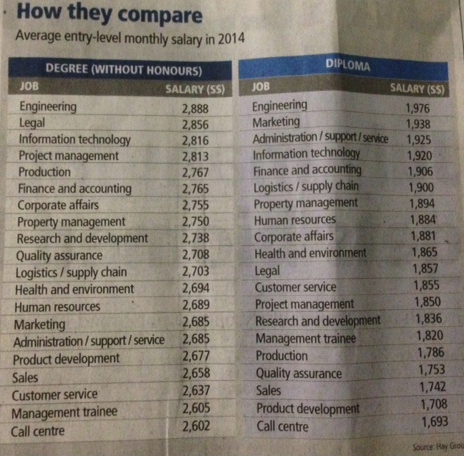 This is around 32% lower than what fresh diploma engineering graduates get today at S$1,976. Are you happy with your Fresh Graduate Pay then/now? Fresh Graduates in Tokyo, Hong Kong, China and Singapore - What Now! I graduated about the same yr as you. I'm in civil engineering and the pay was about 1.7k per month. It's the doldrums in the construction industry and they are really not hiring. It was quite a different picture when I entered university because civil engineers are one of the more well paid engineering job around. Oh well...I didn't work in the sector at all. A lot of my friends went to take phD...I wanted too, but I thought I might be digging a deeper grave for myself. Still, I've no regrets taking engineering course. The training of the mind is something I can use for the rest of my life. Thanks for the maiden comments on my blog. Heartfelt appreciation! Civil Eng is one of the “most siong” faculties to be in, long hours of lectures and tough subjects. Not easy! Once graduate, working hours are long and employee work output received NOT always proportional to the input contributed. I have many friends just like you who did not work in the sector after graduation. Perhaps that is the shortcoming in our education system that government is starting to correct now? Nevertheless, I must agree that engineering background is a good stepping stone for me. At least in work it assists me technically now. It also strengthens my math and science foundation for the tuition classes I provided many years after graduation to earn extra income. At least you were honest that you were not "prepared" for the first 2 interviews. Feels great on the 3rd interview when you have "beaten" a big stack of your "competitors" no? It's all about "getting in"! Indeed, the first two failures were results of insufficient preparation and also “too greenhorn” without interview experiences then. The 3rd success was great more because I got a job and not so much I beat a stack of interviewers, since I need the money badly to repay for school debts. I was probably lucky because my then-boss told me that he prefer a subordinate that does not have too good a results like myself – more obedient I think, and also someone that comes from a humble family background – more hardworking maybe in some cases?. End of the day, luck and “yuan feng” with the interviewer do play some part! Experiences not soley from work but also from life experiences are far more important later. I always think Integrity, Mindset to Improve Oneself and EQ matters most - definitely outweighs your graduation certificate! I started my first job 7 years ago at a starting salary of $2400. I think the difference between yours and mine could be the timing presence value of money. One thing in common that you see is we get our starting pay fairly average but here we aredoing rather fine learning and picking up from every experience that bypass us. Nice to see you here again. 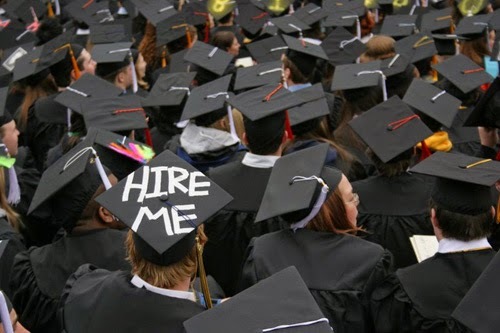 I think 7 years ago is a good time to graduate, thereby getting a job quickly. However the downside is, your good time is only short-lived dogged by the crisis a year or so later. Anyway, the timing and starting salary is probably not utmost important for fresh graduates. Maybe it is important to get into a sector that you at least do not hate! Some of friends get into IT and hate it!!! And then get a job that teaches and exposes you as much as possible when you are young and grow your knowledge/experiences thereafter. Suffer early and learn, then sow the seeds of success later. We probably go through that and still doing fine now.